Welcome back to the Autumn Term and to year three! This term is going to be filled with many exciting learning opportunities and we look forward to watching the children work hard and develop their independence! Please scroll down to download the curriculum letter to parents/carers. The information on the letter is contained on this page, but is downloadable via the link. In English children will be reading two texts, one shorter and one longer: ‘The Lost Happy Endings’ by Carol Ann Duffy and ‘The Turbulent Term of Tyke Tiler’ by Gene Kemp. Children will be exploring the texts and sharing their enjoyment for reading through discussions in class and during class guided reading. They shall be using the images and text within the books to explore grammar and punctuation, before recording ideas in their books and completing a ‘cold task’ and ‘hot task’. These tasks will incorporate the grammar and punctuation skills they have learnt through the term and will be used as an assessment method in writing. Children will be learning how to write instructions in this term, using the class texts. For the last week, children shall be looking at shape poetry and will perform these, before then writing their own shape poems. Children will be reading ‘The Turbulent Term of Tyke Tiler’ by Gene Kemp as a main text in guided reading sessions. This will allow children to have discussions about what they predict will happen next and discuss characters actions/feels and infer meanings behind these. During class guided reading sessions, children will also have guided comprehension sessions, where they will answer questions about a text, find important information and record their answers in their books. Children will also be expected to read between the lines and infer their own meanings. In maths, children shall be covering the following units: ‘place value’, ‘addition and subtraction’ and ‘multiplication and division’. The aim is to understand the composition of numbers, with the ability to represent numbers in a wide variety of ways: partitioning, writing in words and drawing them. They will also need to be able to compare and order numbers to 1000. Finally, children will be adding and subtracting 3-digit numbers, using column method. The multiplication tables children are to learn this year are 3s, 4s and 8s. At the beginning of the term, children will revisit 2s, 5s and 10s that they learnt in year 2, to ensure they are fully confident before moving on. Children have their own TT Rockstars log in, which they can access at home to continue practising. They will receive one merit for each day they access the site at home (this is to be written and signed in reading diaries by parents/carers). In art the children shall be looking at the work of Edvard Munch, exploring the emotion portrayed through his colour and brush strokes. Children shall be using the book ‘The Lost Happy Endings’ by Carol Ann Duffy from English lessons to produce their own piece of artwork to show the emotion of the character Jub, combining it with Munch’s technique and style and their own. In DT pupils will be making Roman catapults, linking in to their History work. They will also be using the skills gathered in their art sessions to create Christmas Cards. In history, children will be learning about the Romans! They will begin to understand why the Romans invaded Britain, how Celtic Queen Boudicca rebelled with Icini Tribe and how the rest of the Roman families lived, such as women and children, whilst the Roman soldiers were out fighting. Children will produce a WANTED poster for the capture of Queen Boudicca and will create a timeline of the Roman invasions. Finally, children will begin to look at Roman Inventions and this will lead on to producing catapults within DT sessions. In science, children will learn all about forces in magnets, using key words such as: pulling, pushing and travelling. They will be given the opportunity to carry out experiments, making predictions about what they think will happen and then writing an evaluation about their findings. Reading books – We believe that reading is an important skill. With this in mind, your child’s reading book will be sent home every night. We would ask that you encourage them to read to an adult at least four times a week. Please feel free to write any comments you may wish to make in the reading record diary. One merit will be given for each day they read. Homework – Weekly homework will be sent out on Friday. Homework tasks are not compulsory, although we do encourage children to complete these to enable them to consolidate skills and deepen their understanding. Homework will include short tasks linked to Maths, English and weekly spelling where appropriate. We will spend the first session of each Friday morning discussing and marking the homework and therefore ask that homework is completed and back in school no later than Thursday in preparation for this. PE – This will take place every Friday afternoon for the first half term, then both Wednesday and Friday afternoon in the second half term. Please can children bring their PE kit in on a Monday and leave it in all week. PE kits can be sent home for washing on a Friday. We would also like to take this opportunity to outline the school’s policy on PE kits. The school requires that, for indoor PE, all children wear a plain white t-shirt, and plain black shorts. For outdoor work during colder weather pupils should wear a tracksuit (or jogging bottoms and a sweatshirt) and trainers. This half term we will be doing Gymnastics in the hall with the apparatus. Water bottles – Research has shown that drinking water helps improve concentration. Please bring a clearly labelled bottle of water into school every day for your child. TT Rockstars/IXL – Children are encouraged to access TT Rockstars to practise their multiplication tables. They also have access to IXL to practise key maths skills that they will encounter in year 3. We advise that they access the skills taught in the past week (which will be similar to the homework task sent) to secure these. Children will receive a merit for each day they access TT Rockstars and another merit for each day they access IXL. We ask that parents sign reading records with a short note to make us aware that your child as accessed these, therefore allowing them to receive their merits daily. 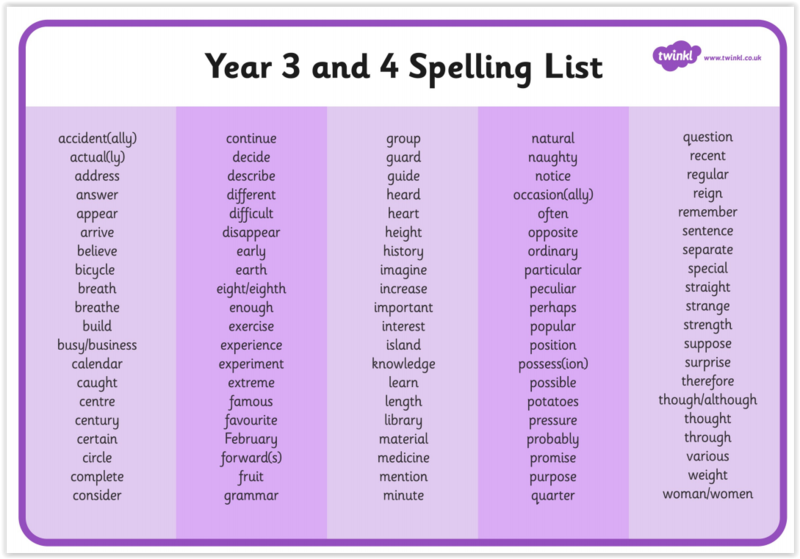 The following learning strategies are useful in helping your children to learn spellings at home – Year 3 common exception words, as well as personal inaccurate spelling need to be addressed. Please find the year 3/4 common exception words further down. Write the word out on a sheet of paper ensuring that it is spelt correctly, and it is large enough to trace over. Trace over the word and say it at the same time. Move next to the word you have just written and write it out as you say it. Turn the page over and write the word as you say it, and then check that you have spelt it correctly. The splitting of a word into its constituent phonemes in the correct order to support spelling. is to write as many words as possible within a time constraint. Pupils can write words provided by the teacher or generate their own examples. For example, in two minutes write as many words as possible with the /iː/ phoneme. This can be turned into a variety of competitive games including working in teams and developing relay race approaches. might work on those that are just a little more difficult to remember. IXL Develop your Maths skills in all areas!